For the past 50 years, German parents have been eternally grateful to a puppet figure gently coaxing generations of German children to make their way to bed shortly before the seven o'clock news each evening. First appearing on East German television on 22 November 1959 in the program Unser Sandmaennchen, the Sandman soon had a "brother" in the West in a children's program produced by Sender Freies Berlin. One of the more positive effects of German reunification was that the East German Sandman continued to scatter sleepy dust into children's eyes each night and now appears on many of the regional "third" channels as well as the KI.KA children's channel. Almost ten years ago, Jan Bonath of the Frankfurt-based stop-motion specialist Scopas Medien began thinking about the idea of a feature film based around the Sandman character. "The Sandman is so well known in Germany – everybody knows him – but we don't have any idea where he comes from or anything more about him. It is an untold story," Bonath recalls. Gripped by a curiosity to build a story around this character, the producer developed plot ideas to pitch to broadcaster RBB. "Initially, they were rather skeptical because it was felt that a feature film with the Sandman might have an adverse effect on the existing brand," Bonath says. After all, in the feature film, we will see the Sandman with a mouth – this is strangely absent in the TV programs – and he speaks 'on camera' for the first time! However, after some to-ing and fro-ing, the broadcasters finally agreed to grant Scopas Medien the rights to make a feature film based on the Sandman and his world, and RBB, MDR, NDR and KI.KA are all serving as co-producers. The screenplay, which was written by Katharina Reschke (THE O'SULLIVAN TWINS) and Jan Strathmann (LÖWENZAHN), won the Hesse Screenplay Prize last year and is being realized by Danish animator Jesper Moeller whose other credits include ASTERIX AND THE VIKINGS and MULLEWAP - DAS GROSSE ABENTEUER DER FREUNDE. Meanwhile, Sinem Sakaoglu, who served as the production manager on the Toni Ungerer adaptation THE THREE ROBBERS, is making her directorial debut as co-director. Bonath points out that the 8.5 million Euro project was pitched on no less than three occasions at the annual Cartoon Movie co-production market to look for potential co-producers or financiers: initially as "in concept"; then in 2008 "in development" when a teaser was screened to illustrate how the style and look differed from the original TV series; and then this year in Lyon as a project "in production". "After showing the teaser we had a lot of strong interest from Eastern Europe, France and Scandinavia," Bonath recalls. Subsequently, France's Bac Films came onboard as the film's world sales agent, a pre-sale was made to Scandinavia, and Amuse Film – part of the Millimages Group – became a co-producer, enabling Scopas Medien to apply for funding from the Franco-German "mini-traité" co-production agreement. While the bulk of the production was undertaken in the Caligari Halle in the Filmpark Babelsberg, a stone's throw from the legendary film studios, compositing work was done in Baden-Wuerttemberg, 3D elements and visual effects in Central Germany, and pre-production and initial puppet construction in Frankfurt. Moreover, some of the important positions in the project's 170-strong crew, like line producer and co-director, are from Hamburg's animation scene. 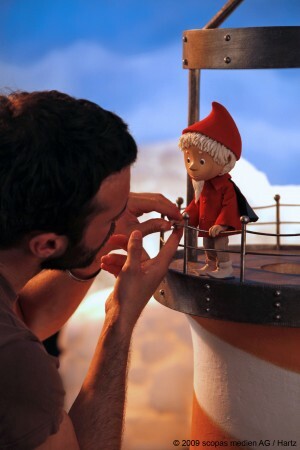 Bonath admits that it wasn't easy to get the crew together for such an ambitious project: "We don't really have a tradition in stop-motion in Germany. Most of the companies working in this field are composed of small teams and so we recruited people from as far afield as France, Denmark, Norway, the UK, Bulgaria and the USA." Veteran actor-musician Volker Lechtenbrink will be providing the voice for the Sandman, while his great opponent Habumar will be spoken by popular entertainer Ilja Richter who will also be Miko's father. The part of the young boy Miko was much harder to cast, as Bonath explains. "Originally, we had a big casting drive, but didn't find the right boy there. It was only at a voice casting for a parallel project that we came across Bruno Renne who is the same age as Miko and had the same kind of character we were looking for."